Yes you read that right, Samsung Galaxy Note 7 is going to be the direct installment to last year's Galaxy Note 5. Nope, there is no Galaxy Note 6 as Samsung wanted to align the phablet's naming with this year's Galaxy S7 series and also to avoid confusion from consumers. And it is now officially announced, well sort of, as Samsung has already sent out invitations to its Unpacked Event which is to take place on August 2 to formally unveil the next generation of S-Pen operated Galaxy Note device. "First and foremost though, you might be curious as to why it's called Galaxy Note 7 instead of Galaxy Note 6. There are a couple reasons why. First, the Galaxy Note 7 will compliment our Galaxy S7 and S7 Edge, and unify our product profolio. Second, the Galaxy Note 7 will minimize confusion about the latest mobile technology from Samsung, and provide full alignment with Galaxy S smartphones." 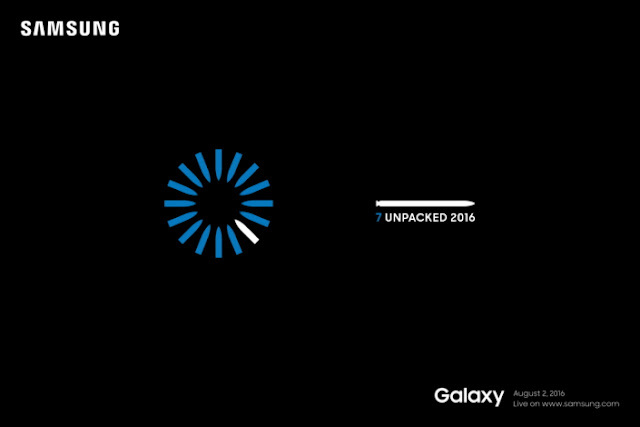 No other details was released by Samsung pertaining to the upcoming Galaxy Note 7 as expected but did confirm that the announcement event called Unpacked 2016 will happen on August 2, 2016 at 11:00 AM EDT in New York. Also, there will be simultaneous launch events in Rio de Janeiro and in London at 4PM. The rest of the world can watch the livestream at www.samsung.com.